Jeramy is 11 years of age. Jeramy's race is Latino, and Jeramy will join an adoptive family as a single child. He is a dependent of Los Angeles County - Placement & Recruitment Unit. His CKC reference number is 501486. Note: No permission is granted to copy or reproduce any text or photographs used in this profile without the written permission of California Kids Connection. 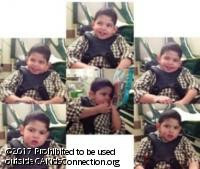 Although Jeramy has endured so much in his short life, he still always greets you with a smile; a very sweet smile that can brighten your day. His body language speaks a thousand words and his positive energy is felt by everyone around him. You will want to talk to him, listen to music with him and even dance with him. He loves attention and will glow with excitement. His favorite toys are those that have multi-bright colors and blinking noises. He knows how to maneuver a toy and pull it up to his ear to listen to the sounds with intent and interest. Jeramy also enjoys watching television and “zones” out when his favorite characters are on! Jeramy is a beautiful child inside and out. He will be a joy to add to any family. With patience and unconditional love and care, your family can help him reach his full potential. * * * The contents of the California Kids Connection website are protected by applicable copyright laws. No permission is granted to copy, distribute, modify, post or frame any text, graphics, video, audio, data, software code, or user interface design or logos. No part of such content may be copied, reproduced, downloaded, disseminated, published, or transferred, in any form or by any means, except with the prior written permission of and with express attribution to California Kids Connection. Copyright infringement is a violation of federal law subject to criminal and civil penalties. You may not, except with our express written permission, distribute or commercially exploit the content. Nor may you transmit it or store it in any other website or other form of electronic retrieval system.